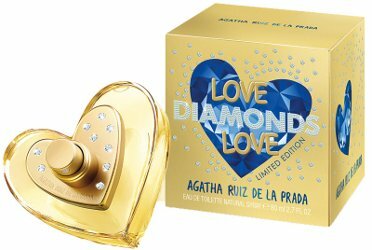 Spanish designer Agatha Ruiz de la Prada has launched Love Diamonds Love, a new fragrance for women. Love Diamonds Love is a flanker to 2011's Love Love Love and follows Love Forever Love and Love Glam Love. Notes for the floriental fragrance include champagne, bergamot, lemon, raspberry, pear, peony, rose, orange blossom, amber, benzoin and patchouli. Agatha Ruiz de la Prada Love Diamonds Love is a limited edition, and is available in 50 and 80 ml Eau de Toilette. Even though I am sure all these scents are basically the same, I have to say, the bottle photographs nicely and the name is GENIUS, because I can without even trying think of about a hundred words that could be stuck in between “Love” and “Love” and make a workable perfume name: Candy, Sugar, Honey, Amor, Amour, Liebe, Petals, Patchouli, Citrus, Money, Sunshine, Snow…. Those flankers could go on until the end of time, no problem.